Parts of the abbey church and domestic buildings remain, notably the gatehouse range and the abbot's house. 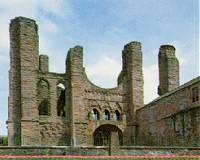 This was the scene of the signing of the Declaration of Arbroath of 1320, which asserted Scotland's independence from England. A visitor centre provides an insight into the abbey's history, which includes an exhibition on the Declaration. The shop features a range of local products made in Tayside. In Arbroath town centre on the A92.